This map accompanied my article “China’s India Example” published in The Statesman on March 25 2008. 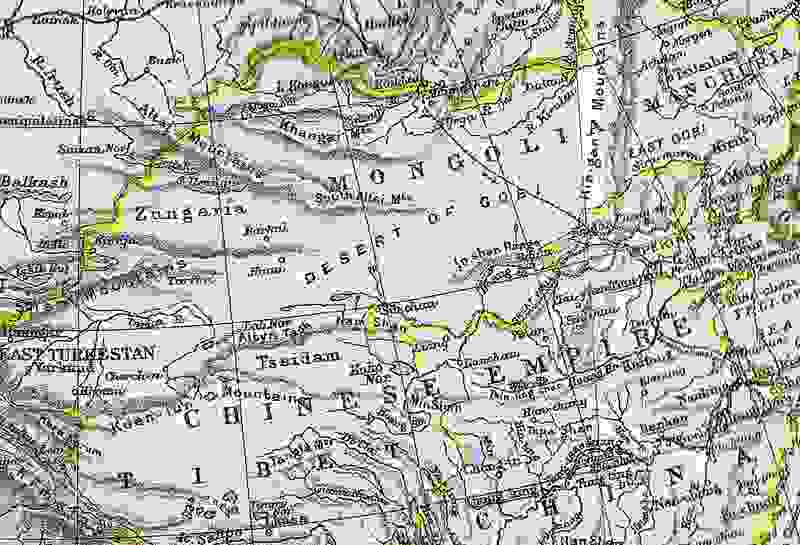 The map is dated c. 1900 and shows the Chinese Empire of China Proper, East Turkestan (Sinkiang, Xinjiang), Tibet, Manchuria and Mongolia (later Inner Mongolia and Outer Mongolia). Smart picture! Why have you not shown the southeast edge of Tibet? Is it because it is inside China’s border? The commentator thinks I have been deceptive. The charge is false. The map, as shown, accompanied, as stated, a newspaper article of mine. It was hard enough to show Manchuria, Mongolia, East Turkestan (Sinkiang) and Tibet along with “China Proper” within the confines of a newspaper article. Postscript: The whole map of Asia as of 1900 of which this is a part now has been also published at this site, please see Map of Asia c. 1900. The Tibet-India border issue or the China-Tibet issue is each far more nuanced than the commentator may be supposing. The map also show him to be inaccurate in his surmise about the Tibet-India border. The historical evidence is, I believe, that neither Aksai Chin nor Arunachal Pradesh was disputed by China. The Govt. of China had back in 1893 recognised Aksai Chin as part of Jammu & Kashmir State. Please see The Hung Ta Chen map, which is the tracing of a map given officially by Hung Ta Chen a senior Chinese official, to the British Indian Consul at Kashgar in 1893. It clearly shows the major part of Aksai Chin Lingzi Thang and Raskam as part of J&K. The same was reiterated in the year 1917. China also recognised the area now called Arunachal Pradesh formerly Assam-Himalaya as part of India. The “Postal map of China”, 1917, a Govt of China official publication, published at Peking in 1917. Actually an imperialist map of China during the relevant period, besides the depiction of Aksai Chin as part of India, the map incidentally depicts all the pre-1947 Himalayan princely states in Pre-1947 India including inter alia Nepal, Sikikim, and what is now Arunachal Pradesh as integral parts of India. http://hindutashravi.blogspot.com/2008/11/arunachal-pradesh-part-of-india.html where 2 maps can be viewed.